I’ve been away from posting on Instagram lately but recently noticed posts that were in rectangular format. This isn’t so evident with landscape pictures because they’ve been around since people realized you can upload the images with white top & bottom borders. The change is more obvious for portrait formats because pictures now appear longer and don’t have the white space/borders on the left & right sides. I imagined Instagram purists around the world in uproar, removing the app from their smartphones in defiance of the change. But then I noticed the other new addition that lets you have multiple pictures using the Layout app, that does away with third-party apps like picframe. This probably balances out any negative response from users and probably get extra brownie points as well. Hyperlapse has been out for 3 weeks now, surprisingly there’s only about 319k #hyperlapse hashtagged on Instagram. For some reason, I’d expected there to be a lot more, perhaps a million at least, but I guess capturing video is more of a hassle compared to taking a photo. There’s also not as many opportunities to sit still long enough to get a worthwhile 10 to 15 second time-lapsed video. Instagram’s tumblr blog post had some great examples of interesting subject matter to record, from a plane taking off, riding on a train, on a bicycle or simply following your kid around. The great thing about this is that you don’t have to be super-still to get a decent video. Another one below of some birds while we were sitting at the bench next to the river. 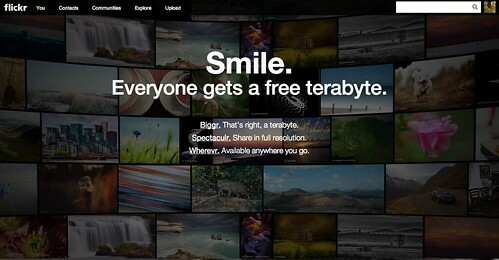 Flickr is Giving Everyone 1 Terabyte Worth of Space! Screen shot of Flickr’s Welcome page with latest update, originally uploaded by holimac. Yep, that’s right. 1 TERABYTE. And you don’t even have to pay for it. As a paid user, I feel I’m getting my money’s worth to have an unlimited number of uploads and no advertisements but I must admit, this is definitely worth considering if you’re not already signed up with a Flickr account. Add to that, with Yahoo buying Tumblr, I’d say Marissa Mayer is taking Yahoo! a few steps in the right direction. My beloved hashtag #cloudporn is no longer..
(Update) but only for a little while.